BDF Digital is a company of BDF Holding S.p.a, an international Group founded in 1906, leader in glass engineering, renewable energy, industrial automation market and nowadays recognized as the first four largest suppliers for engineering solutions and equipment worldwide. 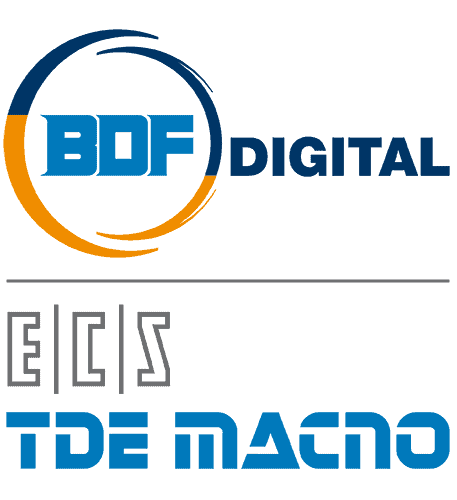 With the main aim to offer both integrated and innovative solutions, in 2017 BDF Digital was founded thanks to the merger between TDE MACNO and ECS , two companies that boast more than 40 years of history and tradition of technological excellence in the field of Electric Converters, Automation Systems and Numerical Controls. Both of them were born in the late 60s, at the dawn of Digital and Automation, applicated to the Industry. With the name of this new company the BDF Industries Group want to strength its own Corporate Vision: a new power for BDF Industries Holding that has always been nourished by innovation, technology and digital solutions. Strengthening the meaning and value of these terms, capturing their precious essence and translating the latter into action: this is the challenge that BDF Digital wants to rake up ant that we will be pleased to share with its customers. Innovating means creating value and inducing a concrete, useful, and positive change in the lives of people, of our businesses and society in general. And from that Innovation we want to start because its our heart, the our real soul: design and develop is what we know to do the best, using our inventiveness and craftsmanship, innovative electronic digital technologies for sectors such as Industrial Automation, Numerical Controls and Alternative Energies. We believe that thanks to digital technologies we can convey smart activity and connectivity to our products, revolutionize our processes and services, re-read and transform our manufacturing industry dramatically, and introduce ourselves as a “solution partner” at national and international level. Digital is the spice of technology. For this reason, BDF Digital through innovation wants to re-reads, renews and redesigns the future not only of TDEMACNO and ECS but also of Drives and Numerical Controls in a unique way.